Roses have become a typical tourist town in the North East Spain, Catalunia. Walking the coast hike in November - passing lots of empty apartment houses in the hilled landscape is almost like passing some ghost houses empty of people. This coast hike was originally made by smugglers bringing their goods between Spain and France. In the first decades of the 16th century Roses suffered repeatedly from attacks by privateers from North Africa. To counter this threat, Charles V ordered the construction of extensive fortifications in 1543. In spite of these precautions, a naval squadron led by the Turkish admiral Barbarossa attacked and plundered the town some months later. After substantial revisions, the fortifications were completed in 1553, under Charles's son Philip II. The entire medieval town was now enclosed by a bastioned pentagonal wall. The defensive system was supplemented by the Castell de la Trinitat, some 2.5 km to the east. The town received a permanent military garrison, which changed its character profoundly. To minimise friction between the citizenry and the soldiers, barracks were constructed, but this did not prevent a gradual movement of part of the population outside the walls, where the modern town of Roses now is. In the following centuries the fortifications were severely tested. In 1645, during the Catalan Revolt, French troops besieged Roses and captured it. The Treaty of the Pyrenees (1659) restored the town to Spain. In 1693, during the War of the Grand Alliance the French captured the town again. This time the French occupation lasted until the Peace of Ryswick in 1697. In 1712, during the War of the Spanish Succession, Austrian troops tried to take the city, but were driven off. In 1719, during the War of the Quadruple Alliance, the French again attacked, and but failed to take Roses. After a long period of relative calm the Wars of the French Revolution ushered in a new round of hostilities. In 1793 the French revolutionary government declared war on Spain. At first, the Spanish armies won a foothold in France, but in 1794 the revolutionary armies invaded Catalonia. The Siege of Roses lasted from 28 November 1794 until 3 February 1795, when the garrison was safely evacuated by a Spanish naval squadron, except for 300 unlucky soldiers. The town was surrendered to France, but the war between France and Spain ended at the Peace of Basle signed in July 1795. The city quickly returned to Spanish control. In 1808, Emperor Napoleon I of France forced King Charles IV of Spain and his son Ferdinand to abdicate and installed his brother, Joseph Bonaparte on the throne. When the Spanish people revolted against this high-handed behavior, French armies invaded the country again in the Peninsular War. The fourth and last Siege of Roses occurred in 1808. 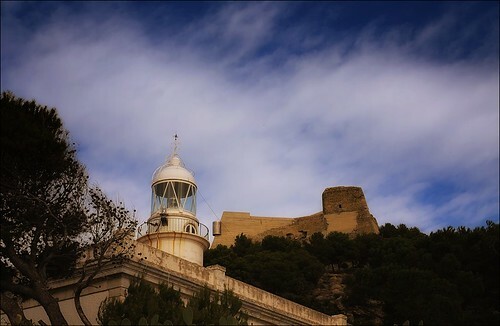 During this operation, the famed Scottish captain of the Royal Navy Thomas Cochrane assisted the Spanish by putting his men into Castell de la Trinitat to help defend the town. The Scot stayed until the citadel and the town surrendered, before finally evacuating himself and his men. In 1814, when the defeated French withdrew from Spain, they blew up the town's fortifications along with the Castell de la Trinitat. At this time, the ancient town, called the Ciutadella, was completely ruined. Meanwhile, to the east the modern town slowly continued to grow.